At Brooms Head on Tuesday morning the wind was up from the south east and so was the swell. I could not reach my Bream spot without risking my neck and I was not prepared to do that – especially when there was plenty of fish in the fridge. Because of the wind and swell I had to switch to a ¼ oz 1/0 jighead. I put on a GULP 4” Minnow in the Smelt colour. 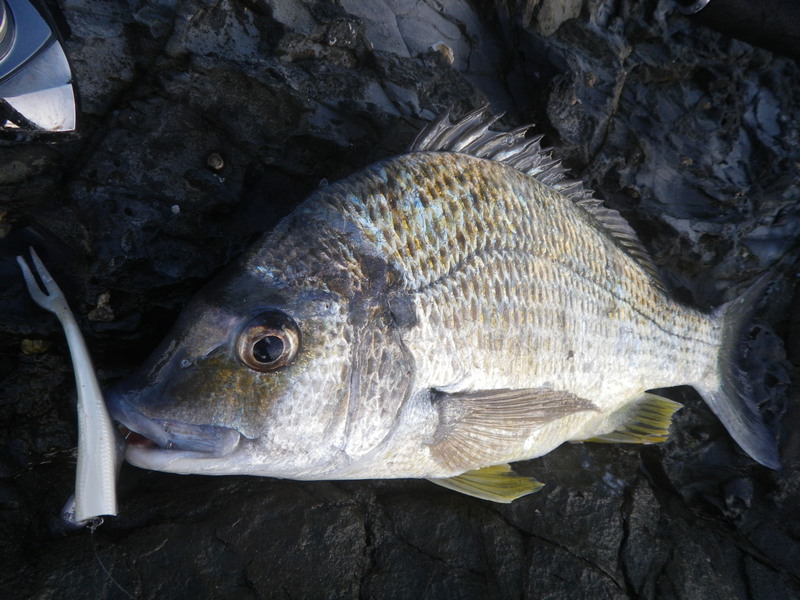 I managed to put a few casts out from the top of the ‘Razorback’ towards the Bream spot and after losing a few jigheads, I did hook up with a nice 30cm+ Bream, but the wind and swell made it really difficult to fish and at about 8.00 am I was forced to give up. On Tuesday night we had a thunderstorm and the swell and wind was still up on Wednesday morning. It was a solid south easterly wind. I walked down to the ‘Razorback’ but there was no point fishing. The waves were crashing over the top of the rocks and the whole area was covered in white water. I watched the surf for a while and then decided to head home for a hot cup of tea. Sunday had been pretty breezy so I spent the day with the family – after all, that is what family holidays are about – I suppose. By Monday I had had enough of them and the wind had eased off in the early morning, so I decided to try fishing the rocks on the southern side of the headland. 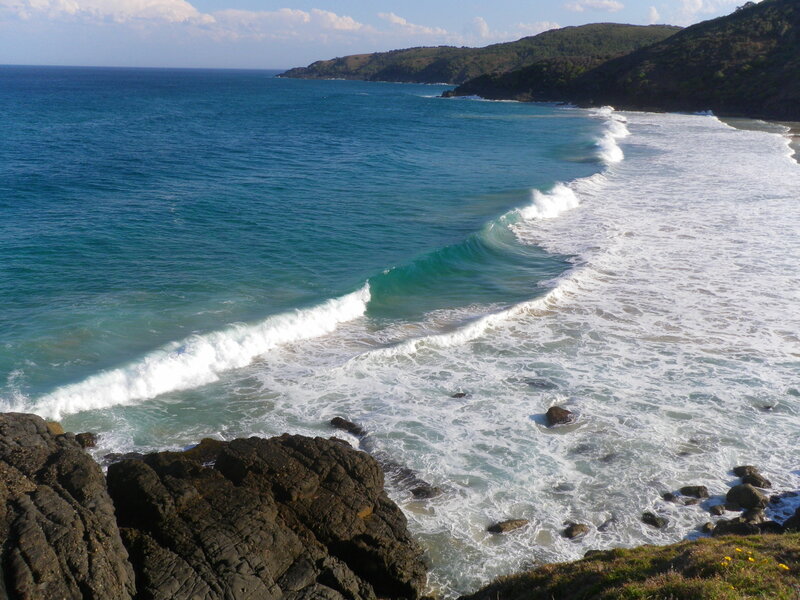 I started out on a prominent rock that juts out into the water, just north of Back Beach. I fished with the Catana Coastline rig again, using a 10lb leader and various soft plastics. I did not raise any bites but first the dolphins came through and then a magnificent black back appeared out of the water. It was a big humpback and the dolphins played around it for a while. I watched the show and then decided to head back to the rocks, known locally as the ‘Razorback’ on the southern edge of the headland. This is a very dangerous spot to fish but, if the sea is flattened by a north westerly, as it was this morning, and there is not much swell – it can be approached, safely. Every now and then a big wave comes over the top of these rocks and I have witnessed several people get washed down the barnacles and leave plenty of skin on them. If you see/hear a big wave coming over, it is best to hunker down and hang on, rather than trying to out run it. Your clothes will dry out quicker than the grazes will heal! I had watched the swell from my other fishing spot for about an hour before I deemed it safe to go out onto these rocks. I had rock boots and a small automatic inflating life vest on. I stuck with the 10lb leader and a 1/8th 1/0 jighead. I chose a brightly coloured GULP 4” Minnow in the Lime Tiger colour, for my first cast. The wind was now negligible but there was a slight ruffle on the surface of the clear water. I watched the lure sink and counted to five. As I lifted the rod tip I felt a solid hit and run. The fish took some line but the Catana and drag absorbed the lunges and soon I had a healthy 34cm Bream at my feet. I lost the jighead on the next cast – snagged tight, as the current wafted it into the rocks. I re-rigged with the same weight jighead and leader but swapped to a GULP 2” Shrimp in the Molting colour. I cast this one along the inside of the ‘Razorback’ and it was slammed in close to an opening in the rocks. It was another solid Bream and it was easier to subdue and land on this side. When I got it to my feet I realized it was a monster – pushing 40cm. I carried on for another 30 minutes and the Bream kept coming. They took all types of small soft plastic – the GULP, 3” Minnow in Smelt, Emerald Shine, Rainbow, Lime Tiger and Pearl Watermelon and the GULP 2” Shrimp in the Banana Prawn and Molting colours. I caught about twelve fish and kept the best four. They were all between 32cm and 40cm. These fish were not fussy. At about 8.30 am I stopped and cleaned my catch in the rock pools. As I looked down, I could see why the Whales were around. The water was full of tiny see through Krill. There were small shrimp like shapes fluttering around everywhere. I thought this was what the Bream could have been eating, but when I opened their stomachs, I found them all empty. I still could not see any bait in the water but at least now I had found a fishy spot. It was on to Brooms Head in Northern New South Wales for our family holiday. Fortunately this represented another fishing opportunity. I have fished here a few times and never found it very easy. The terrain looks incredibly fishy but it often fails to deliver. It is also a very exposed stretch of coast, so the swell can make things tough. Now September can be particularly tricky when fishing from the rocks. The wind keeps changing around and the water can be cool and clear or brown and dirty (if it has rained a lot). Fortunately it was cool and clear at Brooms Head. But it was so crystal clear that it would be difficult to fool the fish. I started on Saturday morning trying to fish the mouth of the lagoon on the north side of the headland. I say trying because the north easterly was producing enough chop to give me a good soaking every 10 minutes or so. I was fishing with the Shimano Catana Coastline light rod with the Shimano Stella 2500. I soon swapped from hard bodies to soft plastics and from 20lb to 10lb leader. I was fishing with a 1/8th 1/0 jighead and a GULP 2” Shrimp when I caught the first fish. It was sitting right in the mouth of the lagoon – a Pike – followed by another, on the next cast. I threw them back and then cast out a bit further. I lost a few jigheads to the rocks and then re-rigged with a GULP 3” Minnow in the Lime Tiger colour. I cast close into a bommie and let the lure sink. It was hit hard by a small angry Bream. It was about 25cm but would not be much of a meal so I threw it back. At about 8.00 am I was soaked through, cold and no longer getting any bites so I gave up. A few fish, but not a very promising start. Friday was another beautiful but frustrating day. My only real fish producing spot, this week, was at the northern tip of the Hat Head headland. So at 4.30 am I was marching out to this spot with all my gear again. On Thursday there had been some Tuna out there and a couple of guys, fishing on the Spinning Ledge had tangled with some kingfish, but not managed to land one. The wind was light from the northwest in the morning and then turned into a stronger northerly around lunchtime. I was there early and tried the usual routine –starting with hard bodies and then changing over to soft plastic Jerkshads. I tried everything, but nothing worked. The Dolphins were in close just after dawn and maybe they had scared the fish off or eaten them. I tried a few more spots around the headland and came back to the Jewfish spot at dusk, hoping to take advantage of the 5.30 pm bite. I don’t know what I did wrong, but the fish did not show up. This was my last session at Hat Head. It had been a great week in a great spot. I had learned the cold water temperatures often mean the clarity improves and fish are harder to fool. I had also confirmed that if there is no bait around then there are no Salmon or Tailor either. I had also proved that there are always fish out there – somewhere. I will definitely be back here, soon. Hat Head was turning into a Jewfish expedition. Apart from a single Trevally, I had caught only Jewfish. On Thursday, I was determined to explore some different spots around the headland and hopefully, catch some different species. There was distinct lake of bait around and the water was very cold, perhaps this was making it hard to catch anything else. I started at the Jewfish spot (could not resist), at dawn. This produced nothing but I did watch a small pod of Tuna swim by just after dawn – of course, they stayed well out of casting distance. By 7.00 am I had not had a bite. The wind was a light northerly so I decided to take the track over to the other side of Hat Head and have a look at the ledges around ‘the Island’. The Island is on the eastern side of the headland and is reached down a steep path. It’s logical to fish this side during strong northerly winds, as it is sheltered. You can walk across a sand spit to reach the Island at low tide but by the time I arrived it was the second half of the run in tide and I could not get out to it. There are rock ledges, channels and drains all around. They looked like they would all hold fish but, try as I might, I could not get a bite. Admittedly, it was neither dawn nor dusk but I was really surprised that there was nothing around. I carried on to the rock ledges around Connors Beach and fished the one known as ‘No.1’. This also looked very promising but produced nothing. After wandering around all day, I had nothing so I marched back to the Jewfish spot, in time for dusk. I arrived about 5.00 pm. I had the heavy rod this time and was fishing with a GULP 4” Pearl Watermelon Minnow on a ¼ oz 2/0 jighead. I was using 20lb fluorocarbon leader. I fished for half an hour with no result and then, right on 5.30 pm, I felt a solid bite. I paused and then struck and there was a fish on the line. I played it out and pulled it round to the easier landing point, at my feet and gently pulled it up the rocks. It was another keeper sized Jewfish – about 60 cm long. There was enough in the fridge, so I released it. I fully expected a few more, but that was it, all over. I fished on for 45 minutes, until it was completely dark and tried a range of soft plastics without another hit. I had wandered around fishing from dawn to dusk for only one fish. It appears I could have rested my weary legs and just fished half an hour at dusk, to achieve the same result. But that is how fishing works, you put in the hours of exploring so that next time, you will have more idea of where to fish and when to fish. I fell into bed after a shower, a few Jewfish fillets and a mug of red wine. Only one fish but that is all you need sometimes. Flushed with success in the Jewfish department – I was up just before 4.00 am and marching out to the spinning ledge , imagining enormous Jewfish. New batteries in the headlamp made a big difference and the track was a little more familiar today. The tide was running in and would be high at 10.15 am. There was a light north easterly breeze and virtually no swell. I arrived at about 4.45 am and rigged the heavy rod with a 30lb leader. I wanted a bit more light before going further round the head to try the Jewfish spot – casting and climbing around that rocky area, in the dark, was a recipe for disaster. So in the half light, I decided to cast a DUO hard body minnow – the Beachwalker MD 120 which has been catching a few Tailor for me, lately. I love this lure it has great action and swims just about 30cm below the surface for most of the retrieve. I was casting to the north from the spinning ledge. I started with a slow retrieve; this did not attract any interest so, after ten casts, I started to retrieve the lure much faster, with pauses and twitches, all the way in. I felt a hit, but did not hook up. I cast straight back out and this time the fish hit it. It was just a small Trevally and I soon had it at my feet. I quickly threw it back and cast out again. I got another couple of knocks and one hard strike, but could not hook up. Then the fish moved on or wised up – either way, they stopped attacking the lure. It was now light enough to move further round, nearer to the tip of the headland and try for another Jewfish. The swell was lighter today, so there was less foamy water and the tide was a little lower. I rigged up with the same GULP Crazylegs Jerkshad in the Black Shad colour, that had caught fish the day before. I stuck with a 3/8th oz 2/0 hook, jighead but dropped back to a 20lb fluorocarbon leader, as conditions were a little less rough. I fully expected to hook up instantly, but the fishing gods had sprung their cunning trap and absolutely nothing happened. I tried every colour and shape of soft plastic, lightened the leader and threw a few hard bodies, fruitlessly, into the rocks – where they remained. I fished for almost an hour before I figured out they definitely were not there or, more likely, were not eating. I walked back to my cabin at about 9.30 am to strategize for the afternoon session and have breakfast/ lunch. 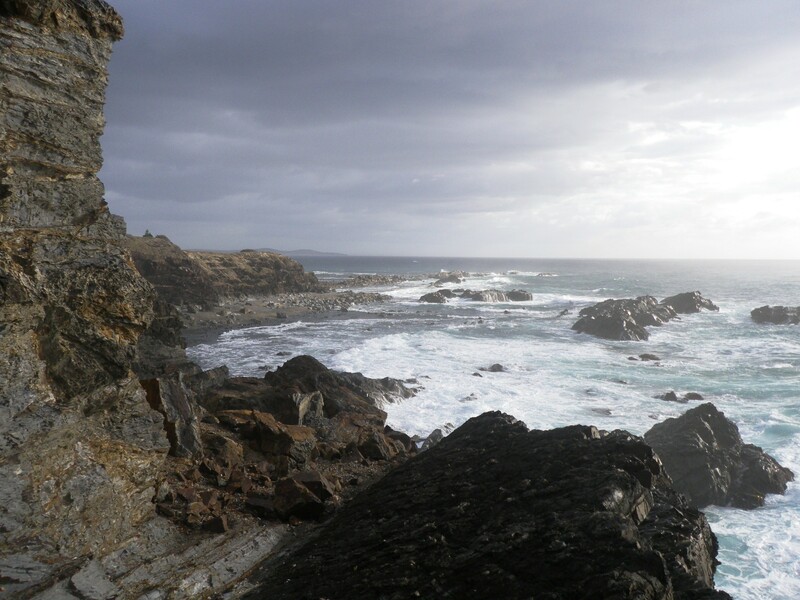 I spent the afternoon exploring the ledges around the headland before Connors beach, to the south of Hat Head. There are plenty of spots to fish here, but it would be a serious struggle to land a big fish on any of these ledges. At about 4.00pm I set off again to fish the same spot at dusk. This fishing lark keeps you fit (if it does not kill you). The trip out to the Spinning Ledge is about 5km return – do it twice a day and you sleep well! I arrived at about 4.45pm and cast around on the Spinning Ledge with a GULP Jerkshad with no result. As the sun dropped behind me, I moved back round towards the Death Hole. There was a stronger northerly wind blowing now and there was a little more swell. The tide was in the first half of the run in. As I had no luck in the morning, I had decided to fish lighter at dusk, with my new Shimano Catana Coastline Light. This is a 10’ 6” rod, rated 3-5kg. I use it with my Shimano Stella 2500 spooled with 8lb Fireline Exceed. I tied on 16lb fluorocarbon leader and a 1/6th oz, 1/0 jighead. I put on various coloured 5” GULP Jerkshads and cast around without success for about 20 mins. Then at about 5.35 pm, just as the sun had dropped behind the headland I felt a very solid bite. The fish was a good size and the lighter rod was no match for it. It soon had the line snapped. I re-rigged with the same set up. First cast and I had another fish on. This one was more manageable and I was able to play it out and slowly swing it over the rocks onto a ledge below and then pull it up by the leader. It was a school Jewfish – just under 50cm. It had what looked like a tag in its back. I was only going to carry one fish back over the rocks tonight and I was confident I could do better, so I let it go. I was now fishing with a GULP 5” Jerkshad in the curry chicken colour (red and yellow). I was still using the 1/6th 1/0 jighead. I had another bite and run, but no hook up. Then, about 15 minutes after landing the first fish, I had another solid fish on. I let this one have its head but tightened the drag enough to keep it away from the rock overhangs. I let it run off steam and watched the swell. When things looked calm I moved down closer to the water, tightened the drag and pulled the fish round the rocks to a point where I could grab the leader. The leader broke almost as soon as it took the full weight of the fish, but fortunately it fell between two rocks and I could reach down and get it. This was a nice fish about 70cm long. It was now getting dark so I quickly gutted it and then packed up. I carefully climbed back round to the track and carried my gear and the fish back to the cabin. Dawn and dusk had produced the only fish today. I was surprised at how cold the water is and I was also surprised that I had not found any Bream on the lighter set up. Apart from a few Whitebait, where I caught the Jewfish, I saw virtually no bait, the whole day. After a quick bite and clean up I was in bed at 7.30pm! A few bad days fishing and a distinct lack of trophy fish this year, combined to convince me I needed to go exploring. I have always wanted to go and fish the rock ledges at Hat Head in New South Wales and so I drove down from Brisbane on Monday. It’s a long way 500+ kms but Hat Head has almost legendary status among rock and land based game fisherman so I wanted to see it and, hopefully catch a few fish. 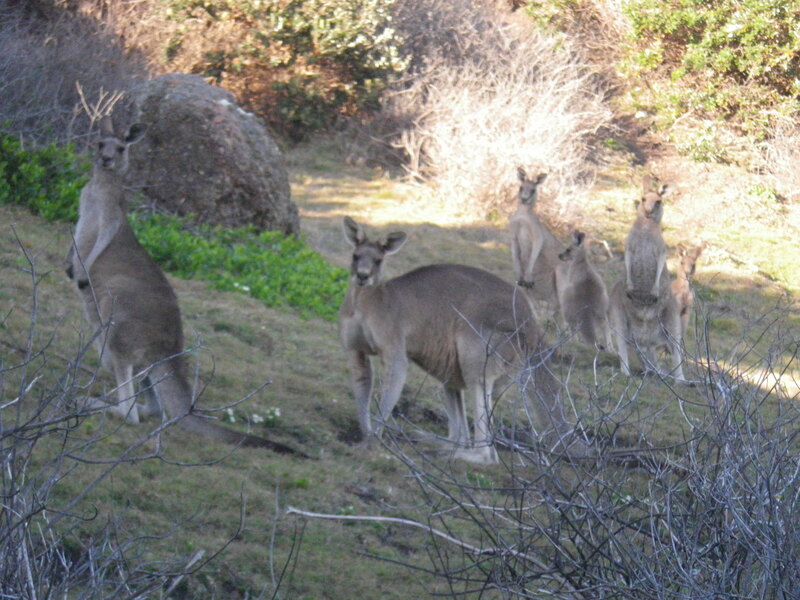 I arrived late afternoon Monday and checked into a cabin at the caravan park. Rain had been threatening all day and a strong northerly was blowing. It was about 4.30 pm, so I decided to walk the track around Korogoro Point (Hat Head) before dark so I could get an idea of where to fish in the morning. It takes about an hour to walk around the headland and the track is pretty good. Next morning I was glad I had done the recce. I was up at 3.30 am and loaded up with light and heavy rods and all my gear and marching across the small foot bridge from the township to the National Park at about 4.00 am. The new moon had emerged on Monday so there was virtually no light. The track was difficult to make out with just my headlamp, so I was glad I had a general idea of where I was going. It was a bit cloudy, but with no moon the stars were pretty impressive. I carried my rods out front to avoid a face full of overnight spider webs. I had decided to fish first on the ‘Spinning Ledge’ on the north east side of the headland. This is probably the safest fishing spot on the headland and seemed like the best place to get acquainted with local conditions. I followed the path slowly along the north side of the headland and arrived at about 4.45 am, just as the horizon was showing a hint of light. I sat down well away from the water’s edge and rigged up while watching the swell. There was lots of foamy wash so I decided to start with the heavy rig and throw a few large DUO shallow diving hard bodied minnows. I was fishing with the Shimano Stradic 8000FJ and Daiwa Demon Blood 962H rod, 30lb braid and initially, a 30lb fluorocarbon leader. First on the scene was a whale, less than 50 metres off shore, I heard it blow and scanned the water. I just caught site of its shiny black back as it submerged. A minute or so later it reappeared. It hung around for about 15 minutes surfacing every now and then. I started fishing, but after about thirty casts I had not had a bite on the hard body, so I decided to swap to a soft plastic lure. I stuck with the big rod and tied on a 3/8th oz 2/0 hook jighead and chose a GULP 4” Smelt Minnow. I did not get any bites for about 15 minutes. I then felt a solid hit at the base of the rocks, but did not hook up. I pulled the plastic up and it had a big bite mark. I peppered the area with casts but came up blank. I moved a little further round the rocks towards the area known cheerily as the ‘Death Hole’. There is an inlet here which looks like it has a cave at the back. The mouth of the inlet looked very fishy so I changed soft plastics to a GULP 5” Crazylegs Jerkshad in the Black Shad colour. I cast out into the middle of the inlet and let the lure sink. When I started the retrieve I thought it was snagged, in fact I think a fish had eaten it and taken it under a ledge. I tightened the drag and gave a solid heave to try and break it off and then it came out and started fighting. I loosened the drag a little and looked at my options for landing the fish. It did not look good, the water was a few metres below me and there was a flat wall down to it. I tried to pull the fish around to the front of the mouth of the inlet to a more sloped ledge, where I could grab it. But the fish would not give up, I tightened the drag again but it just kept taking line as I tried to turn its head. Then I saw it – it was a very decent Jewfish – around 10 to 15 kg. Try as I might I just could not get it round to the landing point and after a decent fight it eventually got its head down under a rock and the leader sawed through. I caught my breath, re-rigged with the same soft plastic and thought a bit more carefully about where to land a fish, if I found another. I cast out my offering and the fish took it before it reached to bottom. This was a much smaller Jewfish and I was able to lift it up with the rod. It was just over 50 cm, so I put it in the keeper bag. It was now about 6.45 am and high tide would be at about 9.30 am. I cut the head off the soft plastic, put it back on the jighead and chucked it back out. Three casts later and I was on to another fish. This one was bigger so I let it take a few runs in the wash before coaxing it round to the sloping rock. Then I tightened the drag and pulled it up the sloping rock with a decent wave. I grabbed the leader and gently pulled it up to my feet, where the leader snapped. I grabbed the fish. It was another Jewfish that measured just under 70cm. Over the next hour, I had a few more bites but no hook ups. I got snagged and lost the last of the GULP Crazylegs Jerkshads in the tackle bag, so I swapped to a regular Jerkshad in the Cajun Chicken colour and dropped down to a 20lb leader. A few casts later I felt a solid hit and I was hooked up again. This was another small Jewfish, around 45 cm. I landed it safely, took out the lure and put the fish back. I carried on until about 8.30 am and then decided it was time to get the fish back to the fridge. It was a long walk back with about 5kg of fish and all my gear, but it had been a great introduction to Hat Head.